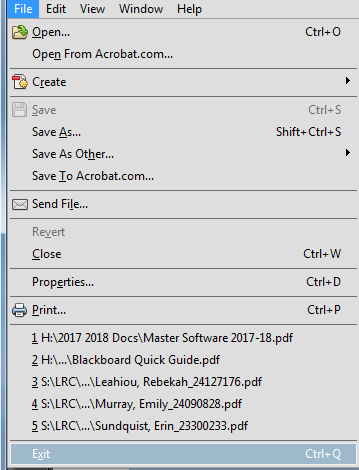 How do I print a .pdf file? 1) Click File>Print from the top left of the PDF document. It is sometimes convenient to print more than one page of your .pdf file onto a single page, much like the multiple slide feature available in applications such as Microsoft PowerPoint. In the Page Handling Section>select Multiple Pages per sheet from the Page Scaling dropdown menu. Select your desired options from the Pages Per Sheet and Page Order menus. Note the print preview changes as you select different print options. Note: The printer icon in the Adobe toolbar will also open the print menu box. Increasingly, pdf files are opened and printed while in an Internet browser. If you do not see a print icon, press the keys Ctrl-P, and a print dialog box will pop up. Check the print preview carefully, as Internet browsers printing functions are not as reliable, or sophisticated as using Adobe Acrobat. If a file continues to open only in the Internet browser, download and save it. Then right click on the saved file, and select the "Open With"...."Adobe Acrobat". Then follow the above directions for managing your print job.